We have marked a remarkable position in the market by offering the best quality array of Olympus Micromanipulation System. Use: To precisely positioning in animal surgery, electrophysiology, injection, and pipetting. With vast industrial experience, we are involved in offering a wide range of Hydraulic Micromanipulator. 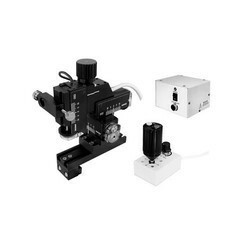 These manual control clamp mount micromanipulators are used with supports such as the Magnetic Base for Clamp Micromanipulator to precisely position electrode holders over a cell chamber. If required, it is recommended to be use with microscope magnifications up to 250x. We have been competent to provide our valued patrons the best quality series of Micromanipulator Machine. The lab have got stereo zoom mocroscopes from Nikon Corportaion, Japan. 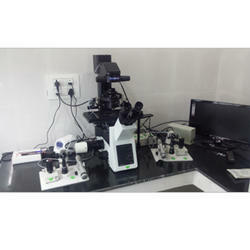 Similarly, The Lab is equipped with advanced, fully motorized Nikon Narishige Micromanipulator systems. The Nikon-Narishige system is the most widely used system, worldwide.